Cannoli are a delicious Italian pastry dessert made from a fried pastry shell containing a sweet ricotta based filling. Originally from Sicily, the dessert is a favourite in Italy and is 100% calorie free*. 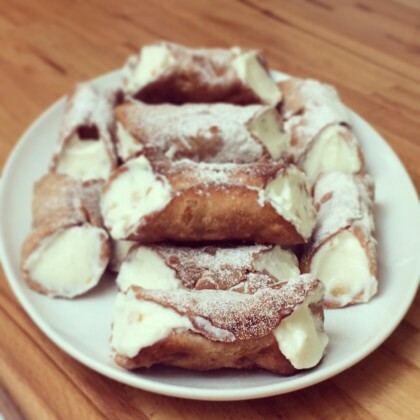 I have no idea why we can’t buy them readily here in the UK but, for those of you bitten by the cannoli bug (or keen to see what the fuss is all about), I have a delicious recipe for you right here! This recipe makes approximately 32 cannoli measuring 4-5 inches long. They can be kept in the fridge for a couple of days but if your family isn’t as large or gluttonous as ours you may want to halve the recipe. First make the filling by stirring together the ricotta cheese with the icing sugar until a smooth, silky mixture forms. Stir in the candied fruit well, then place in the fridge to chill while you make the shells. To make the shells stir together the flour cocoa powder and sugar. Add the butter to the mixture and mix in well. Pour in the wine. The wine is not for flavour but to relax the gluten in the flour. (You can also measure up a little extra wine if you like, you know, if the chef also needs a little relaxing. We’ll call it a vital part of the recipe). Bring the mixture together to create a firm, pliable dough. If it is a little dry you can add one egg or a little water to the mixture. Chill for 30 minutes to an hour. 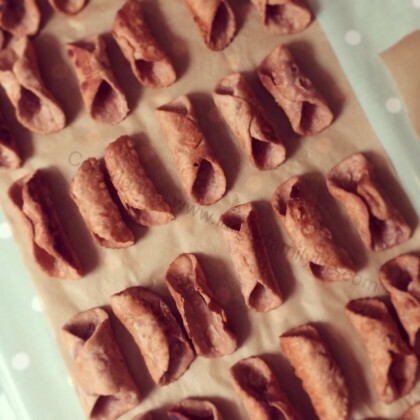 Once chilled roll out the dough fairly thinly and cut into rounds using a 3″ cutter. Take each round and roll once again shaping them into slight ovals as you do so, to a thickness of 3 or 4mm. 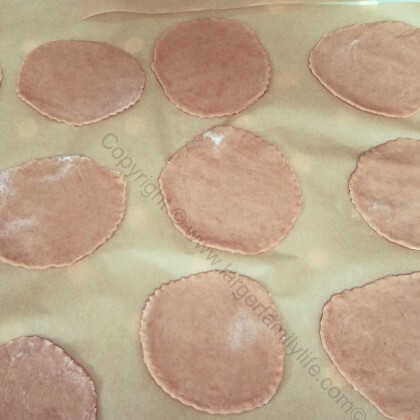 Roll out the cut pastry rounds again shaping them into slight ovals as you do so until they measure approximately 3-4mm in thickness and 4-5 inches across. 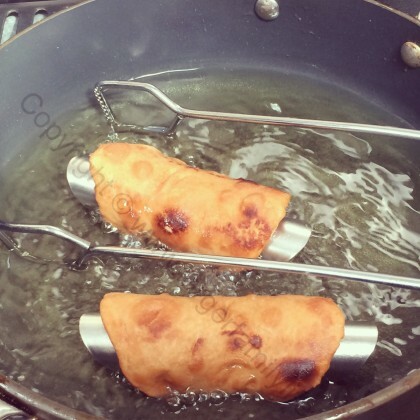 Wrap each circle of pastry around a cannoli tube. You can buy cannoli tubes on Amazon or you could also use an old broom handle cut into 6″ pieces. 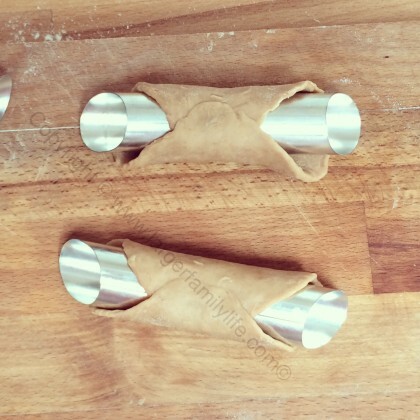 If you’re really stuck you can create your own cannoli tubes with kitchen foil by cutting off a strip approximately 18″ long. Fold down a third of the way, then fold over again. Start rolling the foil tightly from the short side of the strip and you’ll have a ‘tube’ to work with. Pour approximately 2″ of olive oil into a pan and heat up until very hot. 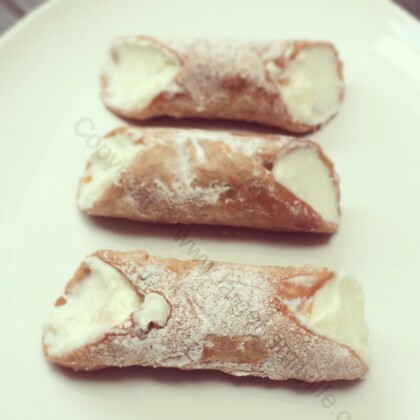 Use tongs to gently place each cannolo (that’s the singular for the plural cannoli), into the pan. It won’t take long for the cannoli to fry. Move them around regularly using the tongs in order to ensure each side is fried. You will see the shells expand and bubble – that’s normal. Occasionally you may find the shells expanding so much that they unroll from the cannoli tubes. Use your tongs to hold them together, popping any large bubbles of air forming on the inside which may be pushing them open. Remove the cannoli from the pan and place on some kitchen roll to cool. Use the tongs to wrap the shells back around the tubes if they’ve opened up. Hold for 10-20 seconds and that should get them back into shape. Once cooled slightly you can remove the shells from the forms. Place the shells on some greaseproof paper and allow them to cool completely. Once the shells have completely cooled you can begin to fill them. I use a teaspoon just fine. Fill them from both ends, pushing through the filling so it goes all the way through. Smooth off the edges so that they run flat against the sides of the shells. When you have filled all the shells gently sift some icing sugar over them to finish them off. Store them in the fridge until it’s snack time. You can experiment with the filling, adding chocolate chips or chopped nuts. In fact, you can add pretty much anything you like to them! We hope you enjoy this recipe and please do let us know if you try it out. Oh, and share it, because you know, good things are meant for sharing and all that but please don’t reproduce it without permission (although links back to it are welcome with thanks). *Oh yes, one more thing. You know I said that they were 100% calorie free? The truth is that they are not quite 100% calorie free. Not quite as in, not at all. But they are delicious and I think delicious far outweighs calorie free. And this disclaimer is written in small writing so that makes them almost calorie free. Sort of.